The sun was setting by the time we reached the bison herd. There was a haze in the air created by smoke from the wildfires and dust from the rutting bison. Our vehicle was quiet as everyone took in the sights and sounds of the prairie. Earlier in the evening, we had set out in search of the bison herd. It was the last day of the Young Professionals Leadership Network’s (YPLN) annual visit to the Reserve and we wanted to spend it with the bison. At the top of a hill, we had a vantage point to see the herd making its way through the valley. The bison were rutting, and the males were producing low, drawn-out grunts as they searched for female companions. Each new bellow had us turning our heads to see which massive male was capable of producing such a sound. With hundreds of bison slowly plodding through the drought-dried grass, the herd made its way past our vehicles. After the sun set, our group returned to the Enrico Education & Science Center to reflect upon our trip. We had done and learned so much. We dug for dinosaur bones on the Timber Creek property and observed the Bear Gulch pictographs, the largest collection of Plains Native American rock art. We encountered diverse wildlife (elk, pronghorn, rattlesnakes, hawks, coyote, burrowing owls) while hiking around the property. Then there was the morning that we had breakfast out in the middle of a prairie dog town. Their high-pitched yips filled the air as we sipped our coffee and discussed the prairie dog’s importance as a keystone species. On one of the nights, we took part in a guided stargazing night hike. Being out in the prairie at night was a unique experience, and under the stars, we listened to coyote call to one another in the distance. 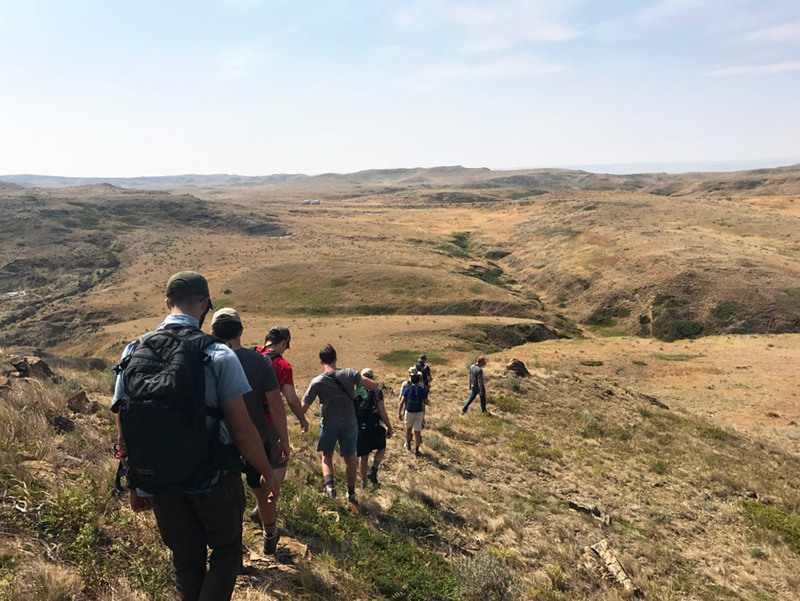 Our experiences on the Reserve strengthen the connection that we as young professionals have to the prairie and to the mission of the American Prairie Reserve. The goal of the YPLN is to foster the next generation of leaders and ambassadors at the American Prairie Reserve. For some young professionals, this was their first visit to the Reserve. They saw firsthand the incredible progress that the American Prairie Reserve has made toward its mission of creating the largest nature reserve in the continental United States. We’d like to continue to expand this annual trip to get more young professionals out to the Reserve. Through firsthand experiences, we want them to learn and connect to the landscape’s past and present, and then play a role in shaping its future. We are already looking forward to next year - come join us! Blog post and photos by Scott Siemens. Scott is Member Engagement Chair for the Young Professionals Leadership Network. Read Scott’s bio here, and find more of his wildlife photography on Instagram @PanopticWildlife.